✔Reliable Heating: This is the most important aspect of any home heating device, and Pleasant Hearth performs admirably. It has a wide coverage and reviewers report it keeps their large houses between 65-70 degrees Fahrenheit even in subzero temperatures! Additionally, the high EPA rating means you are wasting very little pellet fuel. There is also blower included to ensure the heat can spread around easily. Finally, deficiencies in any parts are covered by a 5 year limited warranty. You won’t get a replacement stove most likely, but at least they support replacing parts. ✔Easy-to-Use Features: Some products try to inundate users with lots of useless features, but Pleasant Hearth keeps it simple and effective. There is an auto ignition feature that uses electricity to assist you in lighting the stove (like ignitor on outside grill). Then there is also an adjustable thermostat making it easy to dial in your desired temperature. ✔Design: The Pleasant Hearth has a classic, timeless design. From the cast iron door to the ceramic viewing window-this Made in the USA beauty adds a cozy touch to whichever room it is placed within. The one thing to be aware of when purchasing a pellet stove is that the flame pattern will be different than that of a wood stove. Not a big deal, both look nice, but something to be aware of. Watch your holiday parties get taken to the next level as guests gape at your hot (pun intended) stove. None of these are really deal breakers, but they’re definitely things you should be aware of when finalizing your purchasing decision. ✖Needs Electricity: Electricity is used to power the blower and the auto-ignition. If you are concerned about being reliant on electricity, we suggest purchasing a small backup generator to power the stove in case of extreme emergencies. ✖Potential Quality Inconsistencies: Some people have reported that they’ve been shipped slightly damaged products and others have reported issues with parts (covered by limited warranty). These people were in the minority of users, but definitely something to be aware of. ♥PRO TIP: Ensuring long term pellet stove performance and reliability is due in large part to the quality of pellets you use. We recommend checking out our pellet guide, but here are some good rules of thumb. Look for shiny, and hard pellets that smell like either wood or sawdust (other smells are from additives you want to avoid). Finally, try to opt for smaller pellets as they have a less likely chance of jamming the augur(device that feeds pellets into burn chamber). Hope you learned a lot from our Pleasant Hearth review. There are some cons to be aware of, but with proper usage they can be mitigated. We feel relatively confident in recommending this device and hope it serves you well. This is a great stove for first timers and pros alike! Hope everyone has a great Thanksgiving and good luck with your stove shopping! 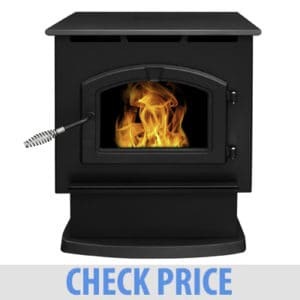 For more stove options be sure to check out our main page. As always, if you have any questions don’t hesitate to reach out!